Attracting the major oyster producers and experts’ conference to Bangor is quite a coup in itself, according to organiser, Dr Jon King from Bangor University’s School of Ocean Sciences, and is a nod to the University’s aquaculture expertise and to the region’s internationally renowned mussel fishery. 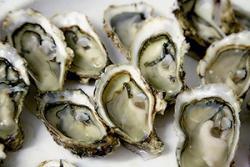 The conference is usually staged in major oyster producing regions around the world, and has been held in Tokyo, Japan; Hangzhou China; Taipei, Taiwan; Hobart Australia; Ho Chi Minh City, Vietnam and Cape Cod USA. A main aim of this Symposium will be to change people’s mind-sets about eating oysters and oyster production, to encourage and enable more people to eat the nutritious, sustainable food source. A delicacy traditionally considered best eaten raw, a focus of this Symposium will be on cooking with oysters. One legacy from the Symposium is an oyster cookbook which is planned. Organisers will be collecting recipes from the international participants for a book celebrating cooked oysters, reflecting the different cuisines of the main oyster producing regions, as well as an appreciation of a food that has been eaten since the earliest modern humans evolved. Introducing terminology appropriated from the wine trade, oyster producers and chefs are increasingly referring to ‘merroir- the marine version of ‘terroir’, the particular flavour that a grape takes from the soil, or in this case, the seawater environment in which it has grown. The opinion formers, scientists, producers, wholesalers, processors and end users attending the Symposium will be appreciating just this ‘merroir’ at a raw oyster bar, boasting oysters from a number of locations around the UK, including the Menai Strait. Two public lectures are also associated with the Symposium. The first at Pontio Arts Centre on Tuesday 12 September 2017 at 17:00 is by Professor Michael Crawford, who discusses The role of sea foods in reversing the global crisis in mental ill-health. Prof Crawford of Imperial College London is the author of Nutrition and Evolution and is president of the McCarrison Society. "A dreadful but exciting life, full of stress, passion and danger" is the topic of this year’s Dennis Crisp Memorial Lecture, presented by Professor Brian Bayne at 5pm on Weds 13th September at the Pontio Arts Centre at 17.00. Prof Bayne discusses stress physiology in oysters, a topic highly relevant to oyster farmers, given the increasing sea-water temperatures and other anthropogenic stressors on our seas. Professor Bayne has made a lifetime’s contribution to our understanding of marine molluscs.